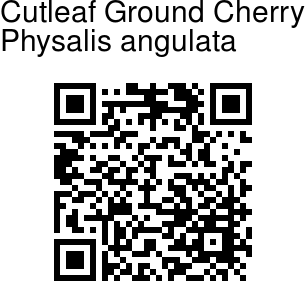 Cutleaf Ground Cherry is a branched erect nearly hairless herb, with angled, hollow stems. Leaves are ovate to ovate-oblong, blunt or pointed or rounded (somewhat asymmetric) at base, pointed at tip. Leaves are wavy-toothed, rather dark dull green, 3-15 cm long, 2.5-10 cm wide, on long stalks 2-10 cm. Sepal cup is 4-6 mm long in flower, 2-4 cm long in fruit. 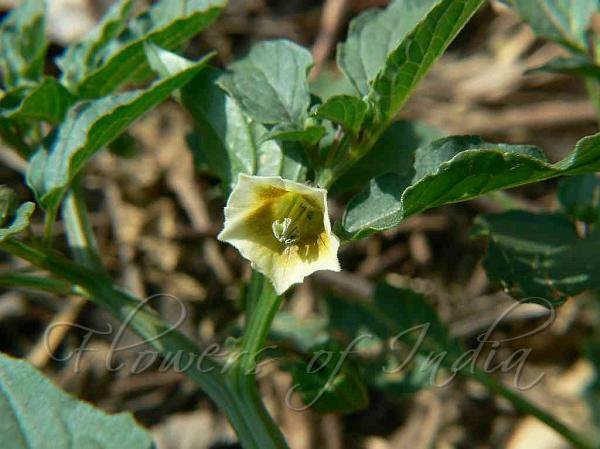 Flowers are nearly 1 cm long, yellowish-green, anthers blue, 1-2 mm. Fruit is about 1-1.8 cm long, ellipsoid, within the balloon-like calyx; seeds about 1.7 mm long, flat, yellowish, kidney-shaped. Photographed in Maharashtra & Manipur.